It can help to smooth fine lines and wrinkles. Figuring out the best skin care routine for you takes time. It can be tricky to determine what products work for you and buying a new skin care product sometimes seems like a gamble. That's why we love a good beauty deal! 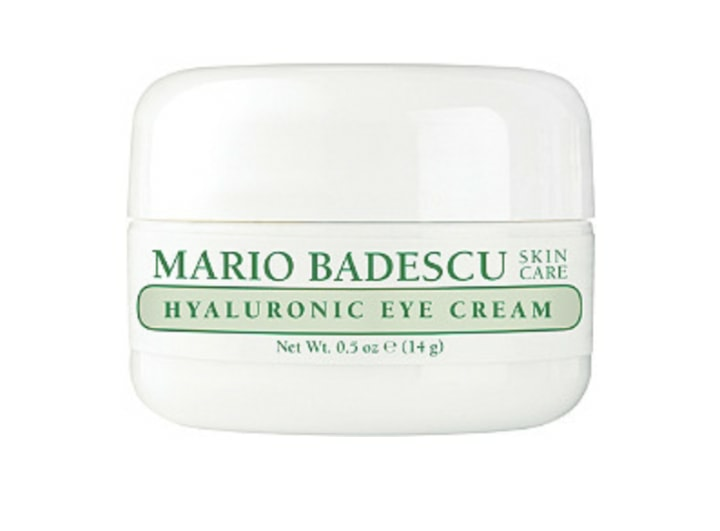 Right now, Ulta is selling Mario Badescu's Hyaluronic Eye Cream at half its usual price. Mario Badescu is a pretty popular brand, used by celebrities like Glenn Close, and their Rosewater Facial Spray made our list of favorite toners. So this eye cream seems like it could make a great addition to any existing skin care routine. According to the company, the eye cream is used to hydrate and smooth the under-eyes, helping to soothe and prevent fine lines and wrinkles. Hyaluronic acid is an ingredient "known for its ability to retain natural moisture levels," according to the company. The eye cream also contains safflower seed oil, euphrasia extract and aloe vera. It also has an average of 4.1 out of 5 stars on Ulta, with over 300 reviews, not too shabby! For best results, it's recommended that you apply a small amount of the eye cream under and around the eyes using your finger once or twice a day. At only $9, this eye cream is truly a steal! Whether you use eye cream often or you want to start incorporating it into your beauty routine, this product is definitely worth a try.